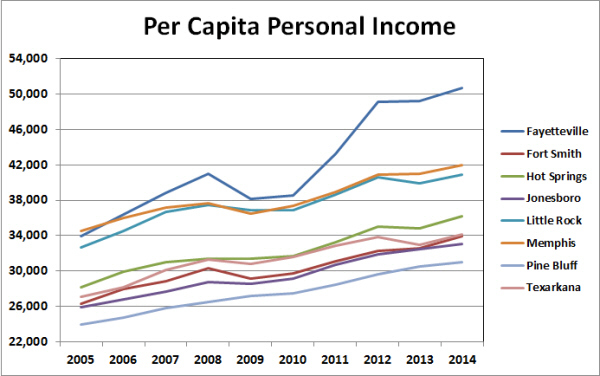 The Bureau of Economic Analysis released new data on local area personal income for 2014 last week. 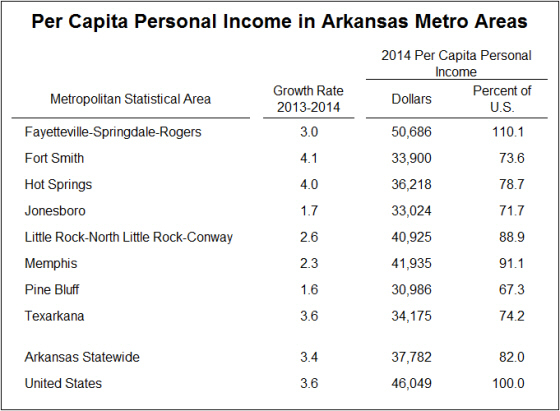 As shown in the figure and table below, per capita personal income increased in all 8 of the metro areas that include parts of Arkansas, with increases ranging from 1.6% in Pine Bluff to 4.1% in Fort Smith. As measured by the price index for personal consumption expenditures, the general level of prices rose by 1.4% in 2014, so all 8 metro areas saw positive growth even after adjusting for inflation. The data release also included revisions of estimates from previous years, reflecting information from “source data that are more complete and more detailed than previously available.” For the most part, the revisions to metro area per capita income were negative. For 2013, the revised data lowered measured income just slightly in the Memphis metro area, but by larger amounts in the state’s other metros. Other than Memphis, the smallest downward revision was for Texarkana (-5.7%) while the largest was for Hot Springs (-9.6%). In contrast, the 2013 level of per capita income for the Fayetteville-Springdale-Rogers Metro Area was revised upward by 30%. A closer look at revisions to data from individual counties shows that the change was primarily attributable to increased estimates of income in Benton County, with the 2013 revision amounting to 63.7%. (Madison county was also revised upward by 13.2%).